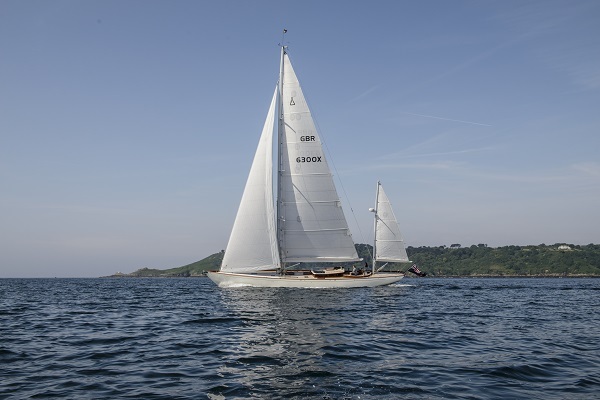 On a warm, sunny day in picturesque Guernsey earlier this year, we caught up with Peter, the owner of the recently launched Spirit DH63, to find out more about his Spirit Yachts journey so far. How did you discover Spirit Yachts? I have known about Spirit Yachts for a long time, ever since they moved to New Cut East at Ipswich Haven Marina in Suffolk. Before buying a Spirit, I owned an Oyster and often saw Spirits out sailing and thought how beautiful they looked on the water. Above: Spirit DH63 Gwenhyfar. Photo: Waterline Media. How did you decide what type of Spirit Yacht was the one for you? I knew I wanted to have as big a boat as possible for an owner/driver to handle without needing any full-time crew. At most, I wanted part-time crew for cruising, race crew for regattas and I wanted to be able to manage the boat myself. I had always admired the Sparkman & Stephens yawl Dorade; she is a really pretty boat as well as a competitive racing yacht. My two primary criteria for Spirit were ‘pretty and practical’ and they have delivered on both. At the very start of my discussions with Spirit Yachts, I chatted to Sean (McMillan, founder and head designer at Spirit Yachts) and we agreed a yawl rig was best suited for the Caribbean sailing I am planning as the mizzen helps stabilise the boat when at anchor in high winds. The other benefit of the DH63 is the deckhouse as it provides shelter in any climate, and offers leeward views from the helm under sail. I always knew I wanted a deckhouse, so Sean designed the elegant coachroof that dips and curves to suit the lines of the boat. Above: the Spirit DH63 has a yawl rig and a deckhouse. Photo: Waterline Media. What are your plans for your new Spirit yacht? 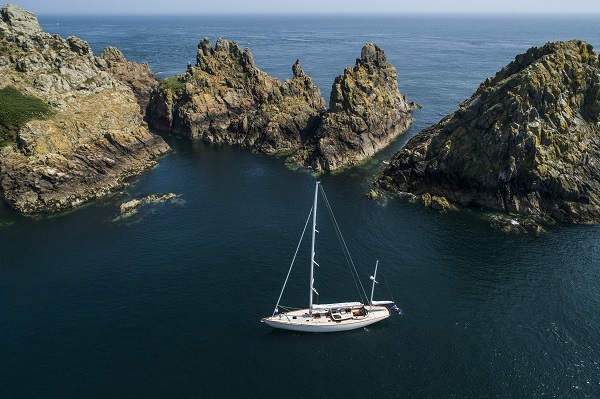 We will start in the Channel Islands, where we are lucky to have beautiful cruising grounds. On a sunny day, with the tide out to reveal white sand beaches and dolphins playing alongside the boat, you could be in the Mediterranean. Then we will make our way up to Scotland and across to Norway to explore the stunning Norwegian coastline and fjords. I am keen to race her in classic regattas, so we will also be taking her to the Caribbean to do the Antigua Classic. We recently competed in our first regatta, Panerai British Classic Week in Cowes, and we had a brilliant time. It was a fantastic event with wall to wall beautiful yachts. The sailing was competitive and yet very friendly. I’m not sure who was in charge of the weather but I suggest we book them again for next year! 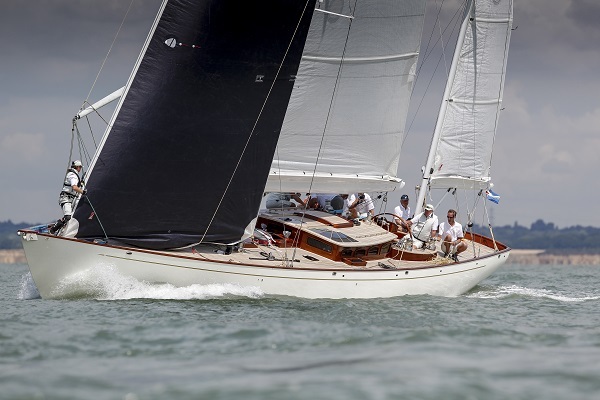 Above: Gwenhyfar racing at Panerai British Classic Week 2018. Photo: Paul Wyeth. She is a Guernsey boat with a Guernsey crew. At the Panerai regatta we had a team ranging from 16-70 years old and we were one a big family for the week. From the crew to the hidden extras, the whole boat is very personal. The little touches make all the difference, such as the stereo system and drinks cabinet under the armrest in the saloon or the hand-built tobacco leather deck chairs. I even have a collector’s item Piedfort coin under each mast; if you look closely you can see the coin edge at the base of the mast. One is for my daughter and one for my mother, so they are very special. 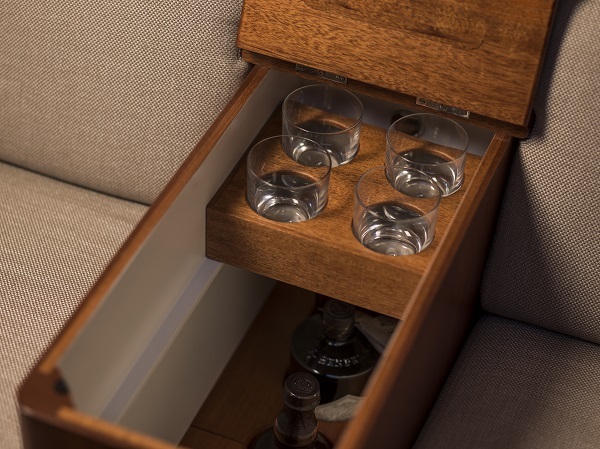 Above: drinks cabinet under an armrest. Photo: Waterline Media. 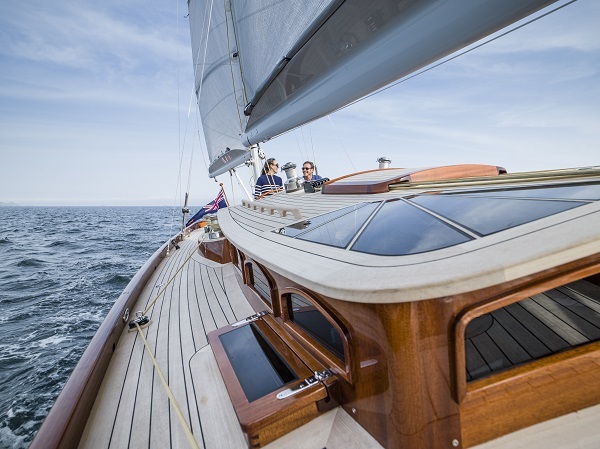 How did you find the design and build process at Spirit Yachts? I know every person at Spirit Yachts who was involved in her build. They are a lovely team and it made the construction phase so much more personal. The whole process was great, it was never Spirit on one side and me on the other; we worked collaboratively, often moving and changing things as the build progressed. Our project manager at Spirit Yachts, Kevin Houghton, did a fantastic job and the craftsmanship on the boat is world class. Spirit doesn’t just build what you ask, it’s a real partnership from the very beginning and I trusted their judgement implicitly. Finally, how would you sum up the end result? She’s a cracking boat and stunningly beautiful. I am enjoying every minute I spend onboard. Click here to view a video of the DH63 in her home waters of Guernsey, including a look at the craftsmanship down below.